Abstract—Energy resources are critical to the development of mankind. Different forms of energy governance can promote innovative environmental subjectivities, but eventually become the stage of constructed rationalities that legitimate the predatory use of natural resources. Thus, the concept of environmentality is used as a theoretical frame to analyze how discourses are used to legitimate the pace, use, and forms of energy production. Primary data were collected in two energy landscapes: Gaucho Biodiesel Pole in Brazil, and Eagle Ford Shale in the United States. Despite distinctive materiality and different governance structures the results pointed to a common timely environmentalism, based on an empty rhetoric. Index Terms—Energy landscapes, governance, environmentality, biodiesel, shale. The authors are with Universidade de Brasília, Centro de Desenvolvimento Sustentável, Brasília, Brazil (e-mail: arnoldosan@gmail.com, fabtoni@gmail.com). 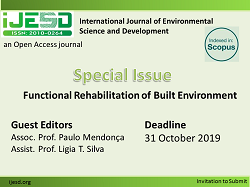 Cite: Arnoldo Lima and Fabiano Toni, "Energy Landscapes and Environmentality: Boundaries between Discourses and Practices in Energy Governance," International Journal of Environmental Science and Development vol. 8, no. 9, pp. 673-677, 2017.